William Hagenbuch will sign and add a personalized message. Includes free shipping to US addresses! When nineteen-year-old Bible College student Joe O’Dell is introduced to Betsy, a beautiful coed who could be the love of his life, he has no idea he is about to learn he is not who he thinks he is. Joe is abducted to a private, billion-dollar lab where he discovers the unbelievable: he has been cloned from two-thousand-year-old burial lines that may be Jesus Christ’s. Held against his will, Joe watches his “almost” normal life through scenes recorded by a genius who wants to know if his clone is divine or not. Distraught, Joe flees. On his own, the once tender now lost soul welcomes darkness, even sin. The runaway never forgets Betsy, a light to him, a beacon. He also remember his college roommate who has his own struggle. When Joe returns to the life he knew, he reconnects with his dad, a church leader who fell apart during his son’s disappearance. Before being called on a special mission to help one special person become a great minister someday, Joe gently touches and teaches everyone around him this truth: God is within each of us. 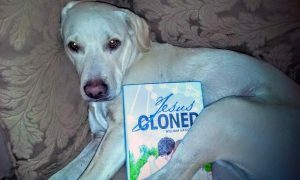 Jesus Cloned is the tender, heartwarming story of a young man’s journey to learn his identity as he intuitively inspires those around him to embrace the Son of God and His important message. While much of this plot-driven novel is voiced in Christian language (the message of love, compassion, mystery and the need to endure), Hagenbuch enables our universal God to come through with an inclusive, solid, and much-needed message of love. JESUS CLONED allows people of other faiths to understand the impact religion and belief have on daily life of his followers. At the same time it transcends Christianity and reaches out to all. Speaking of love, I was moved to tears by the words Hagenbuch put into one particularly intimate scene between Joe and Betsy. In fact the whole story holds your interest and contains surprises until the very end. No doubt the science (cloning) piece to this breakthrough novel propels the plot through the first third of this novel (which is written in three parts "Father" "Son" and "Holy Spirit"), but the gentle, sometimes funny voice of the author is showing us more than a page-turner. Through a variety of characters including a darling girl who is four-years-old, this pastor/author brings us a new lens to see how Jesus interacted with people then, and how that same love is accessible to us now. Now I think that's genius. Theology over science is being sold here. I cried in places, and I'm no fountain of sentiment. I rooted for Joe and Betsy, Dunk and even Roland, and I'm no cheerleader. 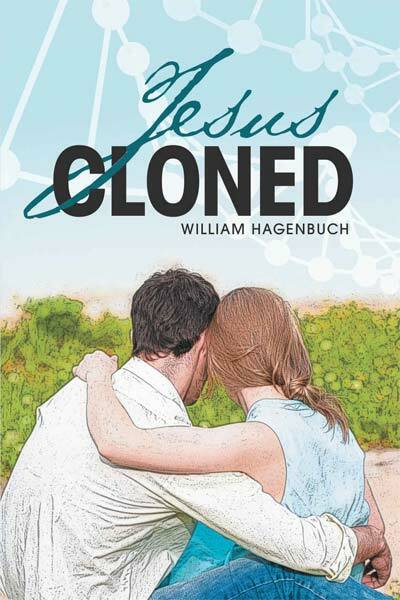 Will Hagenbuch has turned a potential science fiction plot—cloning Jesus (perhaps) from the DNA on ancient burial cloths—into a deeply moving and very serious story of loves, sins, and redemption of many kinds. The clone, Joe Messiah/O’Day, is a 19-year-old student at a Bible college who does not have a clue to his unusual identity. He has grown up with his adoptive father without knowing of his supposed ancestry, but has extra-strong gifts of spiritual strength and presence that he shows his beloved gay roommate, Mike, and the girl whom he instantly loves, Betsy. When he discovers his identity as a clone, and realizes how the scientist who cloned him is a genius control-freak, he crashes to alienation, alcohol, and addiction. His slow, unwanted, rehabilitation addresses the sins and redemption of those around him. This is the best treatment I know of how the divine and human might have been combined in Jesus, and in Joe. The book is a page turner, weaving strands of the basic human (and divine) emotions into a fast-paced story. I highly recommend it for non-Christians as well as Christians. The blonde lab cross is Franklin, and he enjoys cuddling with a good book. 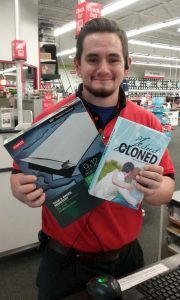 Colby helped me purchase envelopes at the Staples in Dickson City. This very helpful guy held the book, looked at me, asked, "Did you write this?" then added, "Aw, cool!" 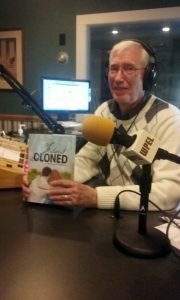 I was interviewd as an author by radio host Larry Souder at WPEL FM in Montrose, Pennsylvania. Hagenbuch, pastor of the First Congregational-UCC church in Harford since 2008, has spent a lot of time with this message. “I want to reach the widest audiences. And my people? The ones I really empathize with? They’re the ones who have been burnt or bored with religion.This novel gives us all a voice from darkness to light, from hopelessness to help. It’s both. Jesus Cloned takes modern technology—cloning—and swirls it with the novel’s essence, and JC is about relationships. There’s an eclectic range of characters from an intuitive four-year-old named after a flower to a Queen Bee deacon well into her nineties. Jesus Cloned does the same. Joe, who is the main character, engages in a myriad of relationships. Some are neat and tidy. Others are hot messes. The science piece is there. It’s used as a vehicle to move the relationships along, particularly in the case of Joe and Betsy’s romance. Dating a guy who is cloned? Think about it. Yes, they’re in love, and their love takes them to unexpected—even confusing—places. Get a glimpse inside the book! There are two excerpts posted online to give you a brief glimpse inside the cover of the book and into the world of Jesus Cloned. Read the prologue and first chapter online today!